West Country DIY and discount chain Proper Job has opened its tenth store, in Frome, Somerset. The company was set up in 1997 by father and son team Ray and Peter Tilley, with a first shop in Weston-super-Mare. It now has three outlets in the town and others spread throughout Somerset. Simon Dewey, marketing and IT support, told DIY Week: "We started selling mainly tools, but gradually we've moved more into DIY and sell tools, paint and other decorating lines, and a selection of wood and mouldings and sheet materials. DIY is a major part of the business, about 30%. "We also do blinds, curtain poles, floor tiles, garden, electrical and general household product as well, so it's a great deal of different products. The selection's grown and grown over the years." 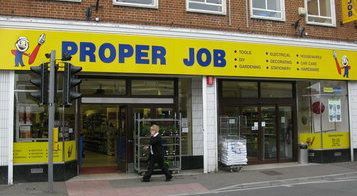 Proper Job's stores vary in size, with the biggest being those in Glastonbury, Bridgwater, Bristol and now Frome. The latest shop will create 10 jobs.